To say an ARB fridge changed my life wouldn’t be an understatement. 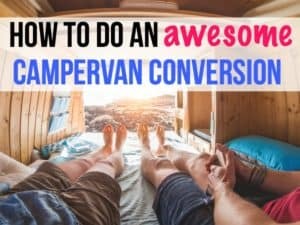 For three years now I’ve been living in a sailboat and a Chevy Astro van in the San Francisco Bay area. When we’re not traveling, I spend my days in my gym’s cafe, working away on my computer. This usually means eating the same thing for breakfast, eating out for lunch. Not getting enough fruits and veggies in my diet. 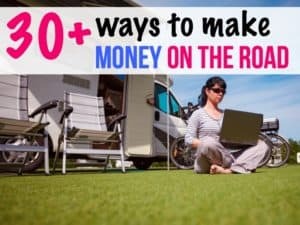 When I did keep food cold in my van I used a Coleman cooler with ice. I can’t tell you how many times that ice melted, ruining my food. For months I’ve been obsessed with the idea of a 12-volt refrigerator and was elated when ARB offered to send me a 37-quart portable fridge in exchange for an honest review. Now, I am able to keep food cold all day long, and so far, the ARB fridge is hooked up to my van’s 12-volt electrical system! It’s doing an amazing job without even needing an extra battery. 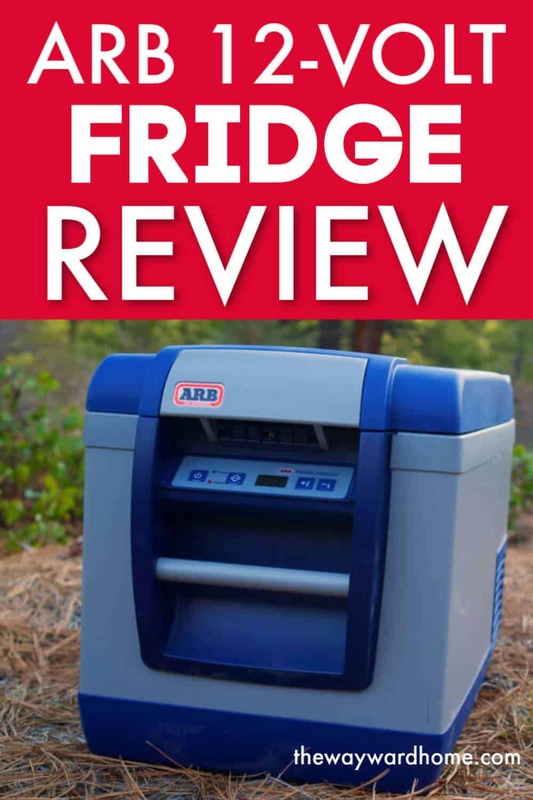 I’m going to tell you why I love this ARB fridge, and why you might want a portable refrigerator, too. What is a portable refrigerator? Isn’t it just a cooler? An ARB fridge is way different than a regular cooler. Portable refrigerators work off the same technology as your fridge at home, using a compressor. This compressor is powerful enough to keep food very cold, and even freeze food. 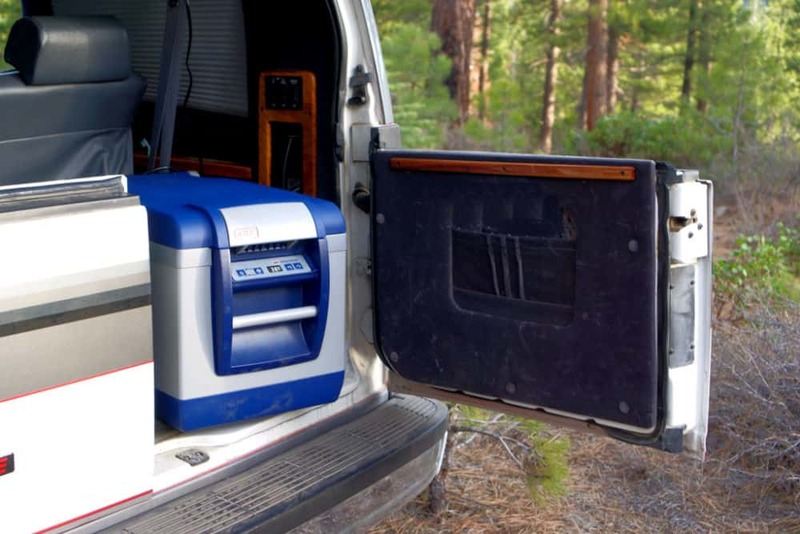 Portable refrigerators are energy efficient and run off your vehicle’s cigarette lighter. They can also be connected to a regular 120-volt wall outlet. 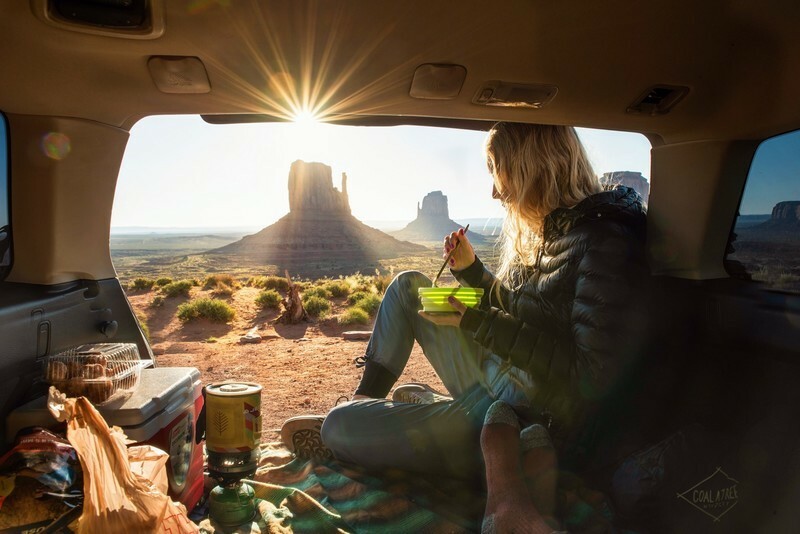 Many campervans have a solar setup to keep their fridge powered up when the van isn’t running. What’s amazing about a 12v fridge is that it sips power. The ARB fridge draws 5 amps when it’s cooling down to the desired temperature, and then averages out at 0.85 amps per hour. It basically turns on just for a few minutes to keep it at the target temperature, then shuts down. A 12-volt refrigerator means you’ll never have to search for ice again. Nor will you have to deal with soggy cheese, fruit or meat when that ice melts. I can’t tell you how many times gross cooler water has gotten into my Tupperware containers. I am so glad that with my new ARB fridge, I’ll never have to deal with melted cooler water again. See the ARB fridge on Amazon. The origins of ARB can be traced to the Australian outback, circa 1975. Founder Tony Brown loved taking his 4×4 Land Rover out into the countryside and soon realized the rough roads wreaked havoc on his rig. So, he decided to invent a line of rugged accessories meant to withstand the beating of overland driving. ARB stands for Tony’s full name, Anthony Ronald Brown. Now, the company is known for its hardy accessories, including its line of portable refrigerators. Here are a few reasons why I love my ARB fridge 37 quart. Nestled under the ARB fridge latch is a handy digital display. I have to admit I’m addicted to checking the fridge’s temperature. This digital display is where you adjust how cold the fridge gets. You can also use this display to set up battery monitoring. If you set the battery monitor to “high”, that means the fridge will stop drawing power when it senses a lower voltage. I can’t imagine having a fridge without a digital display! The ARB fridge freezers are designed to withstand a lot of jostling. They can even operate at a 30-angle, like when a sailboat is heeling. These portable refrigerators are a tough and durable powder-coated zinc steel cabinet, injection-molded base and removable lid and strong steel handles. My 37 quart ARB fridge weighs 45 pounds when it’s empty. Each ARB fridge comes with a battery monitor. You can change the sensitivity of the monitor between High, Medium and Low. A high sensitivity means that the fridge will automatically power down when it senses even the slightest change in voltage. This is very good when your fridge is connected to the cigarette lighter. This ensures the 12-volt fridge won’t drain your car battery. 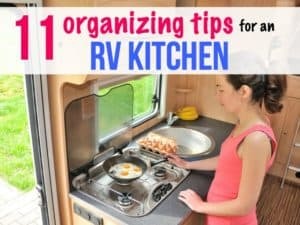 I’ve tested this feature myself, and am pleased by how fast the ARB fridge shuts down after I turn off my van. I’ve noticed the ARB fridge is incredibly well-insulated. Even on 65-70 degree days, the fridge only warms up a few degrees. I’ve been astonished to see the fridge reading 42 degrees when it hasn’t been plugged in all day! I just love that it doesn’t need to be on to stay cold. I love that the wire basket that comes with the ARB fridge freezer can be removed. And so can the divider! This means you can configure the fridge any way you want to best fit your needs. Plus, the portable fridge has a “dairy shelf” above, where you can keep fruits and dairy. This shelf is 5 to 6 degrees warmer than the main compartment. Another cool feature about the ARB fridge is that the lid is completely removable. This makes it easy to load and unload the fridge if you’re storing it in a compact space. 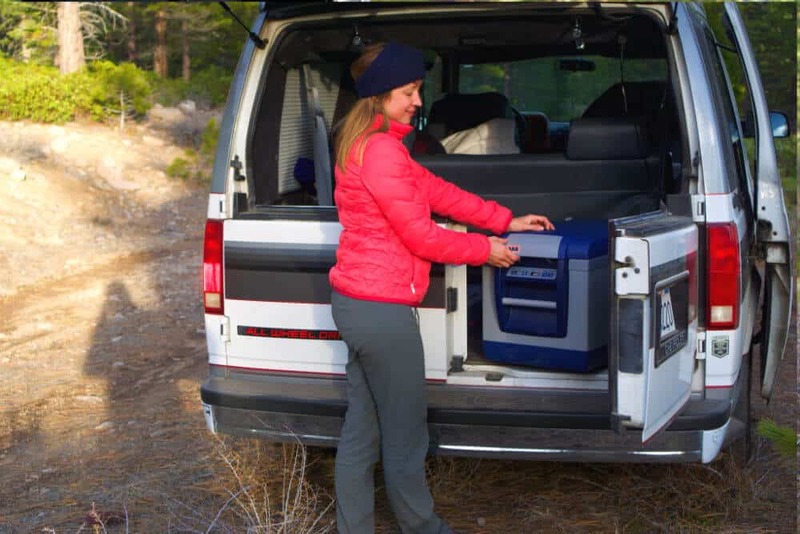 The 37-quart ARB fridge is the perfect size for my Chevy Astro camper van. It fits perfectly behind the rear seat when it’s folded down. I can access it either by reaching over my back seat or by opening my back hatch. This smaller fridge size is perfect for minivans or SUVs. I’ve noticed when I plug my ARB fridge into an inverter in my campervan it cools down really fast. One day, the fridge was 53 degrees, and after just 20-minutes of driving around it was already at 35. I love how quickly this fridge cools down without drawing too much from the battery. 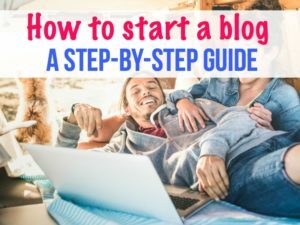 One day, I accidentally left it plugged into my van’s inverter, which draws from the start battery, for four hours and my van still started. 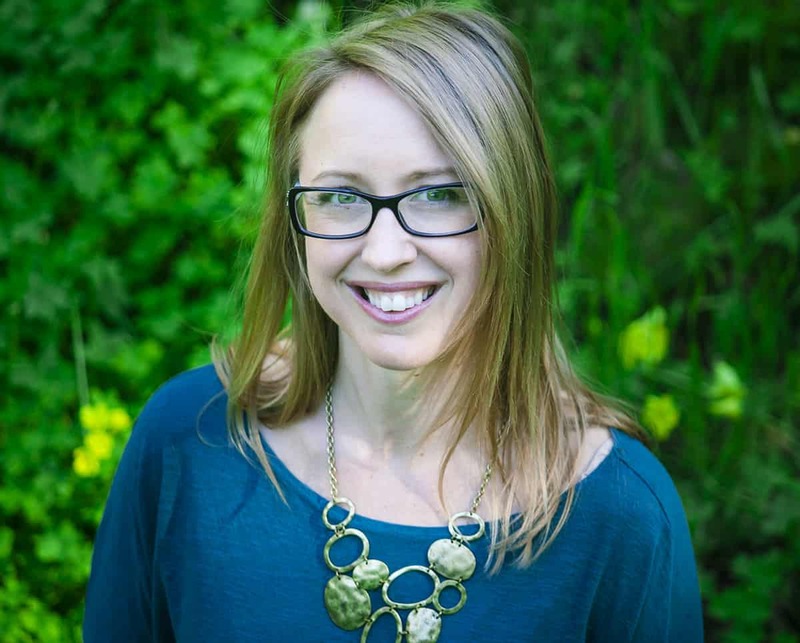 ARB believes in its products so much that it offers a very long warranty: 3 years! This is the longest warranty I’ve found when it comes to portable refrigerators. Click here to browse a selection of ARB fridge/freezers. Everything amazing comes with drawbacks, right? Here are a few things to keep in mind when considering purchasing an ARB fridge. The ARB fridge is basically one large compartment. You can set this compartment to either refrigerate your food or freeze your food. There’s no way to do both at the same time. Luckily, the fridge does come with a dairy shelf to keep foods 5-6 degrees warmer than the main compartment. So even if you do want to freeze meat, you can keep your fruits and dairy warmer. The ARB fridge won’t be in everyone’s budget. It’s very high quality and the quality is reflected in the price. I have the smallest fridge, the ARB 37 quart fridge freezer, which starts at $950. The fridges go up in price according to what size you get. However, you get what you pay for. 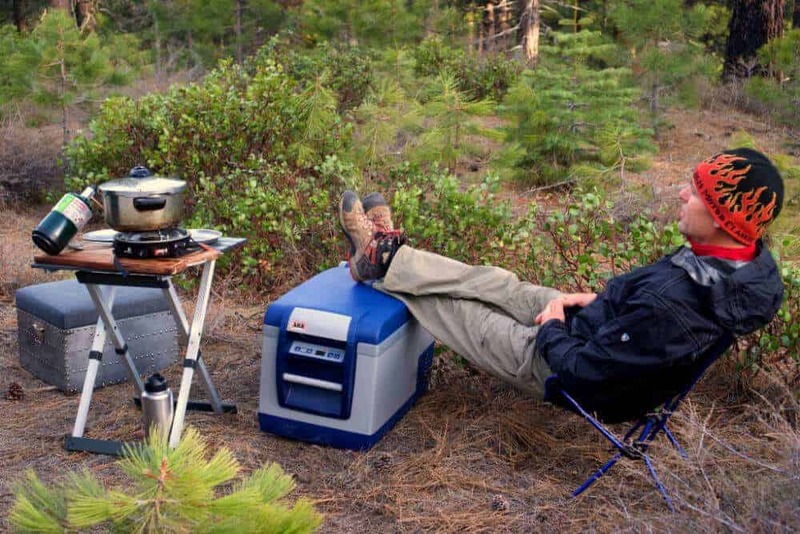 This incredible portable refrigerator will last you years of overlanding. One thing I’ve noticed about the ARB fridge is that it takes a long time to freeze stuff. I’ve had the portable refrigerator set way below freezing, around 22-degrees, for hours without anything freezing. Be prepared that if you do want the fridge to freeze food or ice, it will probably take many hours, or need to be at its lowest temperature setting. So far, I am elated with my new ARB 37 quart fridge. 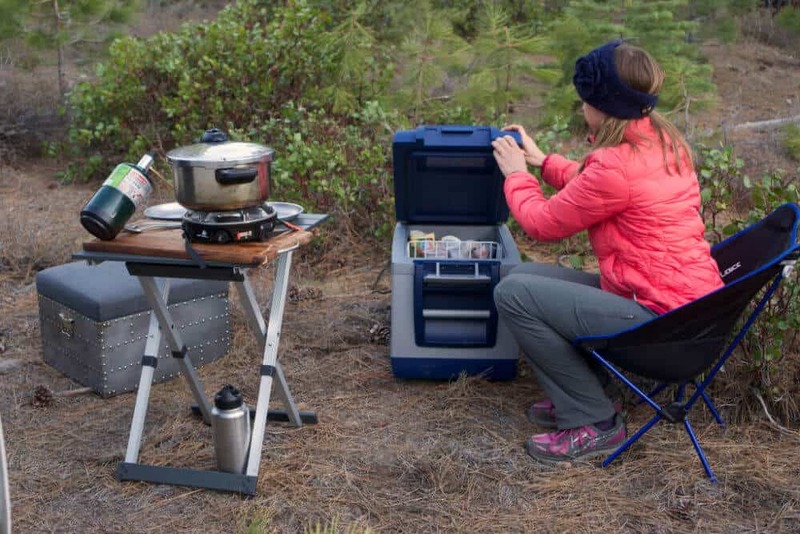 This rugged, durable fridge is perfect for a campervan, sailboat, RV, or any vehicle heading for outdoor adventures. ARB fridges come in several sizes: 37 quarts, 50 quarts, 63 quarts and 80 quarts. You’ll be able to find just the right fridge for your vehicle or boat. These portable refrigerators can cool anywhere between 50 and 0 degrees even if its scorching hot outside. The downside to an ARB fridge is that it can’t refrigerate and freeze at the same time. It’s also the most expensive portable refrigerator on the market, but that’s due to its exceptionally high quality. 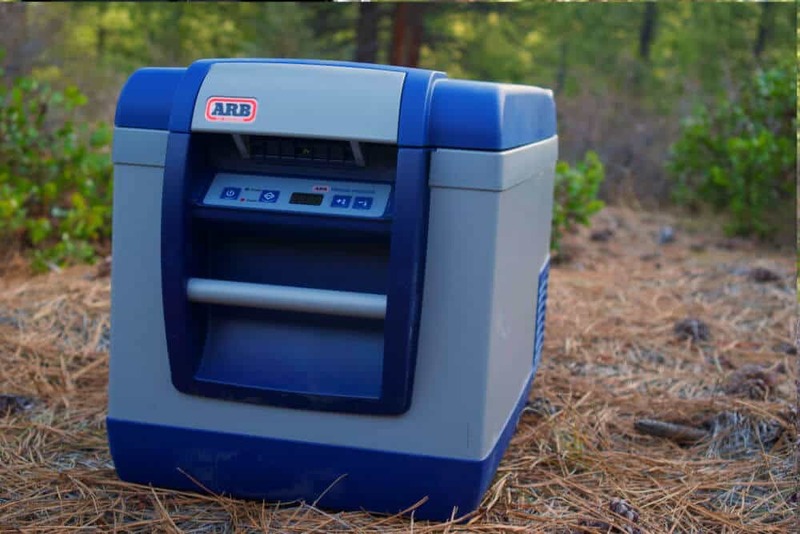 If you’re in the market for a portable 12-volt refrigerator, I’d highly recommend going with ARB.